From 1st October 2010 new legislation as part of building regulations, requires a Carbon Monoxide Detector is installed within the room for all new or replacement solid fuel appliances. 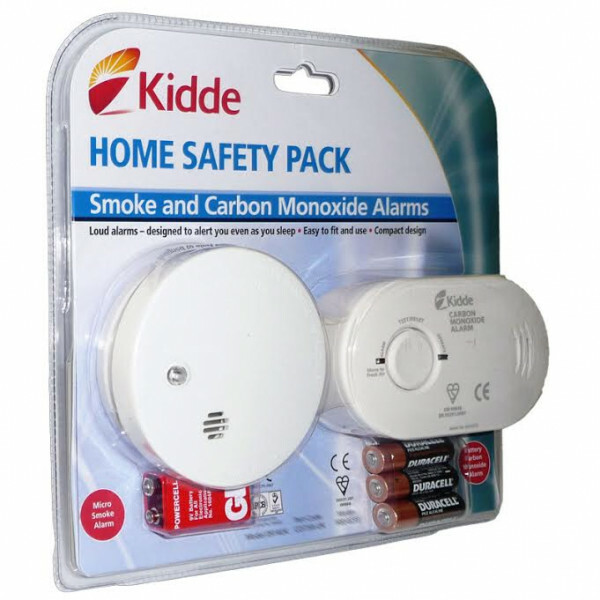 This Kidde Home Safety Pack contains a smoke detector and carbon monoxide detector. The carbon monoxide alarm protects against the dangers of deadly carbon monoxide levels in the home and provides continuous monitoring of CO levels. Battery Operated (3AA’s included) Provides protection during power cut. Two LED’s, Red – Illuminates when in alarm mode & Green – DC power is present, normal operation. Test/Reset Button, Tests CO alarm circuit operation and allows you to immediately silence the alarm. Continuously monitors CO levels detected. End of Life Alarm, Alerts user to replace the alarm after a minimum of 7-years protection. This unit has a test button allowing you to ensure that the sensor and alarm are fully functioning. Certified to BS EN 14604:2005. Fully conforming to BS 5839-6:2004 Grade F.
Flashing red light to indicate unit is powered.